Daniel Chester French took the name Daniel CHESTER French because he loved his Chester so much. He spent his summers in Chester with his Grandfather Daniel French. Sad to say Daniel French’s house burned down but the cellar hole is still there. When Daniel built his studio to sculpt in Stockbridge, Ma. he called this home and studio “Chesterwood”. He totally reproduced his grandfathers living room from Chester for his home in Stockbridge. Daniel “CHESTER” French was born in 1850. He grew up in Concord, Ma. He was briefly educated at the Massachusetts Institute of Technology, followed by sculpture lessons by Abigail May Alcott, Louisa May Alcott’s sister. Daniel also apprenticed with John Quincy Adams Ward in 1870. He also took evening drawing classes at the National Academy of Design. He was only twenty-three years old when he received his first important order for the “Minute Man” statue. This bronze statue was completed at the Ames Works in Chicopee MA, and was unveiled on 19 April 1875 at Concord MA, and it stands near the Old North Bridge on the Concord battle-field where the militia stood in 1775. Important speakers at the unveiling included Ralph Waldo Emerson, James Russell Lowell, and George William Curtis. Previously in 1836 that spot had been marked by a plain monument. Daniel Chester French was Benjamin’s Brown French’s nephew. 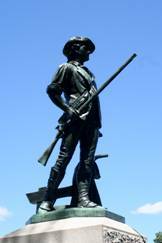 Benjamin Brown French wrote in his journal that it was the Minuteman sculpture that made Daniel Chester French famous. Benjamin Brown French was the commissioner of all public buildings in Washington DC and one wonders if that is how Daniel got the job. Daniel Chester French’s paternal grandfather, Daniel French, was Attorney-General of New Hampshire, and his maternal grandfather, William Merchant Richardson, Chief Justice of the same State. His grandmother, Sarah Flagg French has a connection to Daniel Webster, while his great-grandmother, Dorothy Whittier, was related to the poet John Greenleaf Whittier. He was a neighbor and friend of Ralph Waldo Emerson and the Alcott family. 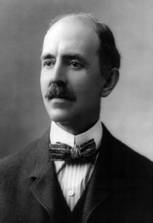 Daniel Chester French is the most famous American Sculptor. And did you know that he sculpted “The Lincoln Memorial” !!!!!! Love, love Chester History!